The author of Foreign Gods, Inc. and Arrows of Rain tells his own immigrant’s tale, where what is lost in translation is often as hilarious as it is harrowing. Okey Ndibe first came to the US to act as founding editor of African Commentary, a magazine published by Chinua Achebe. He has taught at Brown University, Connecticut College, Simon’s Rock College, Trinity College, and the University of Lagos (as a Fulbright scholar). He is the author of two novels, Arrows of Rain and Foreign Gods, Inc., and his award-winning journalism has appeared in The New York Times, The Guardian, and The Hartford Courant. Mr. Ndibe lives in West Hartford, Connecticut, with his wife, Sheri, and their three children. "This page-turner memoir is an immigration narrative that begins with a young man's lucky accident in Nigeria, proceeds with culture shock at an American airport and carries us through the adjustment to citizenship. At times it's laugh-out-loud funny. Its more serious moments offer a poignant look at culture change in a land of steady habits. This book changed my understanding of American immigration." "Okey Ndibe is a natural raconteur, and his tales of coming to America are winsome and lyrical and absorbing. But within lies a larger narrative: about the education of a new American—and a writer’s power to span continents in his imagination." 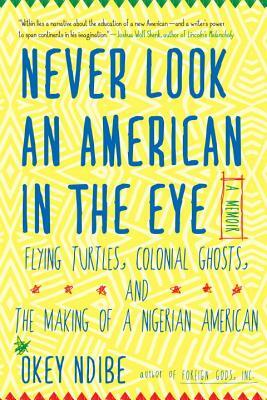 "Okey Ndibe brings a keen eye to his delightful and insightful new memoir. His vision is clearer than 20-20. A writer who can arrive in America, be falsely accused of bank robbery in just 10 days, and still manage to keep his sense of humor is a man with a story to tell. He writes it beautifully." "[Ndibe's] memoir could not be more enjoyable." "[Nidibe's] candor and sense of humor make this an enjoyable read." "Uplifting . . . [Ndibe's] writing can induce the sort of laughter that make the ribs ache." "Ndibe's eminently readable tone is marked by humour, honesty and humility, so that it’s impossible to imagine anyone not liking him tremendously by the end of the book." "A thrill to read, and yet offers powerful insights into the trials, prospects, and triumphs of being an immigrant in America. In a style that is impressively skillful, Ndibe masterfully conveys the odysseys of his early life in Nigeria and as well as his immigrant life in the US. I have never laughed harder in recent years when reading a book." "A generous, encompassing book about the making of a writer and a new American." "Ndibe shapes an entertaining and endearing tale from his many struggles. This enjoyable and quick read is recommended for all memoir lovers." "Seeing this country through Ndibe's eyes is a pleasure everyone should have."